My "favorite" DRM episode was when I was unable to create excerpted clips from a video that I created myself, all because of DRM. Serious fail. Sadly, this is *exactly* my experience with Win7 and my local library. I have just completed Step 18. Sigh. It's tragic, not funny. Tragic! I think some people would say DRM works just fine. For instance, it requires me to maintain a Windows XP partition on my home theater PC so I can watch Netflix on-demand movies; Linux doesn't support the required Microsoft DRM. Come to think of it, I don't think Linux supports any DRM... something about the OS doing what I want it to and not what Microsoft, Sony, or Time Warner want it to. And by sheer coincidence, this makes an increasing amount of content unavailable to me. All you have to do, with any action that occurs, DRM or anything else, is look at 1) who is benefitted by the action, and 2) who is harmed by it. Disregard all the marketing, political hot air, smoke being blow up rear ends, or any other yadda yadda BS. 1 & 2: That tells you who the act is *really* being done for. it's not funny, at all. it's true. I had the same problem with Audible.com. Once in a while, they send you free offers, but it is much easier to get the same content from TPB, without all the strings attached. All that cruft is what keeps me subscribing to a premium usenet service, so I can download the videos and TV shows I want to view, no DRM included. Most are posted in 720p HD format, which plays very nicely on my 37" HD TV or 1920x1200 24" video monitors. If I look at DRM from a 50,000 foot view, its purpose is to force people to learn and adopt unauthorized downloading. By putting up so many barriers to legitimate use, illegitimate use becomes attractive. Consciously or unconsciously, the content industries are engineering their own demise. All they have to do is stop and focus on their customers, and they would do fine. Making their paying customers the enemy with DRM and lawsuits is only insuring their failure. Perhaps the individuals promoting this 'business method' are not working in the industries' best interests? Where's the step after downloading that I send a check to terrorists and drug smugglers. I'm sure I was told that downloading funds terrorists and drug smugglers? Could I possibly sue someone for forcing me to use windows to view drm-protected content? DRM works fine. It's Windows that fails. Get a Mac. This merely illustrates a general problem with too many "security" measures. They impose variously onerous burdens exclusively on legitimate users, while the bad guys have little difficulty circumventing the "security." And when that happens, the "security" people merely increase the burden on legitimate users, a cycle that can only continue. This problem doesn't just apply to DRM or "anti-piracy" software. Think of the TSA, for example. All jokes aside if you want proof that DRM does not work and is known to not work ask yourself why the DMCA exists ? To add to @Mace Moneta I completely agree, I mean you have all these security measures that those who are stealing it simply laugh at, and continue the work they're doing. Meanwhile something that might (this I definitely say might under a large scale) work is what a number of rather indie bands have done (in the idea of music) and put their newest CD up online, for free, then afterwards said, ok, now how much do you think that is worth? Sure you get those who regardless how much they like it won't pay for it because they can't afford to/ don't want to, but you also get many who will pay more then you ever would have asked them for for the same product. Those bands who have done that with their albums I believe every time made more off that one album then any other before in what everyone at first thought was a horrible marketing scheme. "After all if DRM actually worked then the DMCA would be pointless..."
That contradiction is making technology regulation a strongly voluntary process. especially for governments and large NGOs.. I live in Bolivia which is a country in which you actually eat piracy. Ever since the invention of the video tape it has been rampant and available everywhere in streets and marketplaces... I feel compelled to mention that the birth and constant improvement of DRM has not had any effect at all in here, in fact. Piracy is only stronger now than 10 years ago. Playstation 3 games. wii games. Windows apps. 3dsmax. Windows 7. Music. DVD, bluRay movies, etc, etc, etc. No form of DRM has affected us at all beyond making people say this: "Ah, Sony DVD players don't work well, buy Phillips instead, it will play any video"
DRM isn't meant to protect their IP from pirates and copyright infringement, it's a bid for power to force you to rent their product. In the IP-holder's dream world you pay for a limited number of viewings/listens/playthroughs/uses and DRM forces you to pay for more uses. This simultaneously allows them to extract more money from individual customers and allows them to kill both the rental market and the second hand market, allowing them to find more individuals to extract money from. The end of "purchasing" unlimited views in favor of only being capable of renting IP for limited time or uses is their ultimate goal. That's just paranoid, if that were true they would launch new music and video formats every few years forcing you to buy the same content over again. Prolific IT textbook author Will Stanek noted on his site that he'd tracked the sharing of non-DRM'd versions of his textbooks over the course of a year. He sold just under 5000 copies of his book physically and in non-restricted digital format. The same book was downloaded over 150,000 times according to a torrent tracker. The secret seems to be simply not to publish digitally if you expect any form of reasonable compensation for your effort. The target of DRM are the artists. The DRM allows the publishers to keep a monopoly hold on the distribution channel. The only contribution of most publishers is a toll booth between artists and consumers. 20-to-one piracy ratios are not more common than most people believe. Big game publishers are struggling with this same problem: they sell maybe 100,000 copies of a new PC game release, and then in the first week they see between 1.5 and 2 million people playing it. Thats why they keep trying these ever-more-restrictive DRM schemes: They can see how many freeloaders are stealing their content, and if they could convert *a small fraction of them*, even 5-10% into paying customers, it would be a huge boon for sales. The pirate-supporters often claim that publishers are just making up exaggerated, self-serving piracy numbers. But in fact they can tell rougly how many total people are playing it using several different methods--patch downloads, online matchmaking servers, and even through various stats-collecting phone home features (read the EULAs carefully if you are paranoid about such features). For any big mainstream game release on the PC, the number of people pirating it FAR outweighs the number of legitimate customers who actually paid for their copy. So its understandable that the publishers turn to DRM to try and stop them, even if this angers their actual paying customers. 20-to-one piracy ratios are now* more common than most people believe. Numbers of downloads are meaningless. There are a mass of collectors out there that would never, ever have bought the thing and that do not read/play/listen to the thing in the first place. There is a huge number of kids pirating stuff they would not have the money to buy in the first place. (In addition the publishers do lie shamelessly in these numbers and an error of one or even two orders of magnitude is entirely possible.) What counts is revenue. And if the revenue is adequate for the product, then the number of supposedly pirated copies does not matter at all. If a digital product sold an adequate number of times, but the createor gets next to nothing, that is a separate problem caused by greedy publishers, not by piracy. So what is left is the question of how somebody that creates a digital work can get compensated well enough to be able to continue doing it. The current answer seems to be to run as hell from the publishers. This may mean that huge budget productions just do not have a market large enough. DRMing them does not create that market. In fact it reduces the market as people find reasons to not buy the product at all or not buy again from that publisher. I have decided that way several times now. Others will get pirated copies instead, that do not have the DRM. 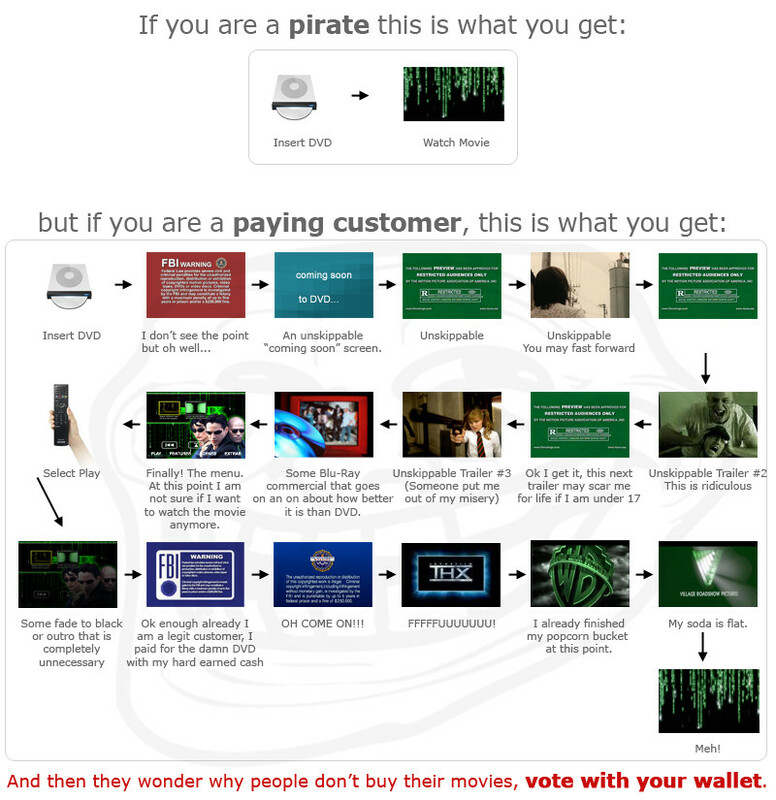 Why people buy the "every pirated copy is a lost sale" nonsense meme is beyond me. These are luxury items that people can decide not to buy any time. This means that in practice that piracy may well cause exactly no lost sales at all and can in fact increase sales. Thinking back, there are seveal games I saw as pirated copies at friends places and then decided to get a legal copy. If piracy gets harder, they can decide just not to get them. The meme only holds true for things that you have to buy like food and that is an entirely different market. I am not sure. By "never attribute to malice what is adequately explained by stupidity" (and greed), DRM server exactly to increase sales, but fails. However with the amount of evidence that DRM does not work and in fact can decrease sales, I think the mountain of stupidity would by now be large enough as to start being implausible. So, yes, your statement that DRM is about control, not piracy, may be entirely correct. If that is really the case, then DRM must be outlawed as soon as possible. Netflix is a good solution to movie piracy because even if you have a fast connection you need a fast download source. By the time most people would be finished downloading a movie torrent they could have watched some or all of that movie via stream. I rarely want to watch a movie more than once in a 5 year period so this works out well. I would be willing to pay a lot more than I currently do for Netflix if they offered all of their titles as Watch Instantly. I never rent by snail mail if I can watch instantly. My Xbox 360 streams Netflix in High Def - it's quite possibly the most useful entertainment product I've used in my life. Music on the other hand is different. Songs are shorter and there's usually enough variety in a 60-70 minute album to justify keeping it around for a while. Services like Last.fm accommodate this need to a degree but the music rental concept as opposed to just being radio may take some time to develop and I think there's a niche to be filled somewhere in between Last.fm and stores like iTunes. What if you could rent say 10 albums at a time and put them on a compatible device like an iPod or Zune and keep them for an unlimited amount of time? While future generations may beg to differ, I still think too many people associate streaming music with radio for streaming music to replace downloads. All I know is that a dollar a song is too much and downloading a torrent is too little. What is Bruce's one key tenet that applies to this? DRM is merely a mechanism to "control" who gets access to "content"... which renders "intellectual property" a "tangible good" for those sitting at spreadsheets. Under another name I once opined that Copyright Violation-- and I was a *writer* at the time, on the Internet-- wasn't a "taking" per se but an "easement", albeit one you would prefer not to grant. An easement isn't a "taking" but it does encumber a property... kind of how derivative works would, too. Bill Gates would never have reached the level of penetration he "enjoyed" in the latter half of the 1970s if his BASIC interpreter HAD NOT been "stolen" for it drove a legitimate trade and *made* a name for Microsoft. I wonder if anyone has looked at the economic model Baen Books has been thriving with? But, then, "Customer Service" does not add to share-holder value _this_ quarter... and the accounting rules don't consider such an intangible as "customer loyalty" to be an investment instead of a cost. Funny and so true... I'm reminded of a friend trying to find an except from an episode of the Simpsons - would have happily bought it from iTunes or similar but all efforts proved fruitless so he ended up downloading the entire series via torrent. I think people would accept DRM if it was priced accordingly. However, IP owners seem to feel that a "watch it twice then a mousetrap disentegrates the disk" video is worth just as much as one I can have until I can no longer play the disc format. The purpose of copyright law is "to promote the Progress of Science and useful Arts, by securing for limited Times to Authors and Inventors the exclusive Right to their respective Writings and Discoveries."